I'll admit, I am not great at reading classic literature. I have a difficult time adjusting to classic prose. I sped through Hemingway, but with all apologies to, Dave Sandager, I picked up what I could. 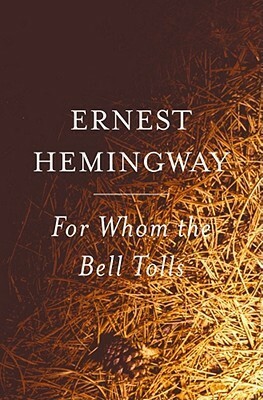 For Whom the Bell Tolls was a difficult read to fully digest, but I really enjoyed Hemingway's lean style. Simple descriptions bring out the life of a piece. "Dying was nothing and he had no picture of it nor fear of it in his mind. But living was a field of grain blowing on the wind on a side of a hill. Living was a hawk in the sky. Living was an earthen jar of water in the dust of the threshhing with the grain flailed out and the chaff blowing. Living was a horse between your legs and a carbine under one leg and a hall and a valley and a stream with trees along it and the far side of the valley and the hills beyond." Life is simple moments. Grain blowing on the side of a hill is one of the most simple things I can imagine. I like picturing life like that. It's nothing fancy, it's just there. I think if we imagine life as a series of spectacular things, we really miss the point. Robert Jordan (the book's protagonist) was really living the bare bones of life in the Spanish hills. "Tommorow can be a day of much valid action. Tomorrow can be a day of concrete acts. Tomorrow can be a day which is worth something." One thing I really loved about my old job with the MCC was when we completed a project. We built stuff, cleaned up things, and took care of tasks. I don't always have that satisfaction in my digital-centered world. I miss the smell of chainsaw oil and woodchips. I think life is really simple, it just takes us our whole life to figure that out.